Antony Loewenstein (Independent Journalist, “Disaster Capitalism: Making a Killing Out of Catastrophe”) joins the show. We discuss how disaster capitalism has spread across the globe completely unchecked, and threatens every citizen on the planet. You can purchase Disaster Capitalism wherever books are sold. “This chilling study, based on careful and courageous reporting, and illuminated with perceptive analysis, helps us understand all too well the saying that man is a wolf to to man,” declares Noam Chomsky. More information about Antony on his website. Stay tuned for further updates about Antony’s upcoming documentary based on his book. 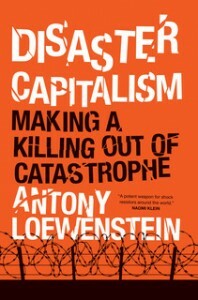 1 Pings/Trackbacks for "Episode #220: Antony Loewenstein (Independent Journalist, “Disaster Capitalism)"